Changing oil in a small engine is usually straightforward, but generators have some quirks due to their design and the way they’re used. Here’s what you need to know from getting oil out of an engine that has no obvious drain plug to ensuring proper break-in on a device that can go unused for months at a time. It’s possible for oil to burn or leak during operation, especially on engines that have seen a lot of hours of use. Always check the oil before each use, and each time you need to fill the tank. Most generator engines come with Honda’s Oil Alert system, which will shut down the engine if the oil level is too low to protect the motor from damage; being proactive about topping up the oil will prevent unexpected shutdowns. To get the correct reading when checking the oil, remove the dipstick/filler cap, wipe it off and insert it back into the filler neck without screwing or pushing it in. On most models, Honda recommends changing the oil after the first month or 20 hours of use, then every 6 months or 100 hours thereafter. You should always replace the oil in the first month, but it’s a good idea to replace the oil after 20 hours of use, even if it has already been changed. That short interval is there to ensure any metal particles left over from break-in don’t stay in the engine where they could cause premature wear. After the break-in, it’s important to change the oil after the specified time, even if it hasn’t been used. This removes water and other contaminants that may have migrated into the oil during storage. On some models like the EU 2000, the engine doesn’t have a drain plug and the entire unit is surrounded by a case to reduce noise. Once the maintenance panel has been removed to access the engine, the dipstick can be removed and the entire generator tilted so that the oil flows out of the filler neck. This neck has a lip that will pour the oil onto a tab on the cover and then into your oil pan. If you’re having trouble positioning the generator for drainage, a marine oil change pump can be used to transfer the used oil from the crankcase to a suitable container. 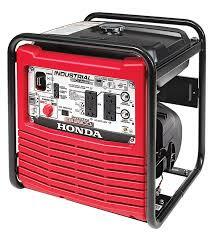 Unlike smaller units, these generators leave the engine fully exposed. The drain plug is located at the base of the engine next to the dipstick, and the frame will clear the drainage area, so the generator does not need to be tilted. Instead, set the generator on a support such as a set of bricks or blocks of wood to lift it off of the ground and slide the oil pan underneath the engine to catch the oil. Honda’s engines are designed to be filled while level with the oil coming up to the edge of the filler neck. A funnel will be needed to fill engines that don’t have a drain plug. While Honda Power Equipment oil is the best choice, the engine used in your generator is designed to use multi-weight engine oil, just like your car, making lubricants readily available. 10W30 is recommended for current engines in most conditions, while 5W30 can be used in extreme cold and SAE 30 can be used in warmer temperatures; check your engine owner’s manual for specific temperature recommendations. This oil should at least meet SAE’s SJ standard, which should be true of any oil purchased in the last couple years. 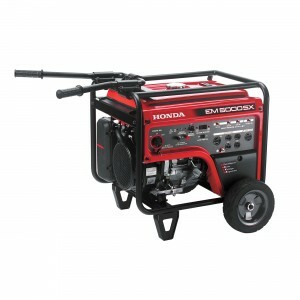 If you need anything for your Honda generator, you can get it from www.hondalawnparts.com. We sell everything from major components to Honda’s own OEM oil so you can be sure your generator will be ready to use whether you use your generator for construction, recreation or as a home backup. We ship parts and accessories across the U.S. and Canada. A Honda generator can keep your tools and appliances running whether you’re tailgating, waiting for a storm to pass or working in remote areas, but only if you have a way to get power from the outlets to your equipment. What should you look for when getting cables to use with your generator? Why are Extension Cables Necessary? The engine in your generator produces an odorless gas called “carbon monoxide.” If it’s run indoors or next to a building, this gas can collect in concentrations that can lead to asphyxiation. Over 85% of non-fire related deaths caused by carbon monoxide poisoning in the U.S. are the result of generators being used indoors. To keep the generator in an open area and still have access to the power it produces, you need extension cables. While you may have some cables on hand, you likely don’t have ones that can withstand the high currents and conditions needed to safely get the most power from your generator to what you want to power. Buying the right cables now will let you put your generator to work as needed to provide power during blackouts and in remote locations. 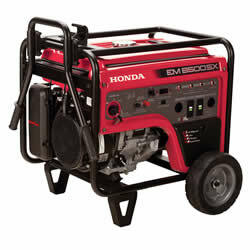 Small portable generators have duplex plugs, while larger generators have both duplex and twist lock plugs. A duplex plug has two 120 volt sockets connected to the circuit by a single set of wires. This means the rated amperage applies to the total draw from both sockets on a duplex plug. When selecting cables, one cable can be used to transfer the full rated power of the duplex plug to the location you need the electricity, leaving the other socket unused. Honda uses Ground Fault Circuit Interrupter (GFCI) three pronged sockets for these plugs, which have breakers that cut the flow of electricity if there’s a short. A twist lock plug has curved blades that are designed to slide into the socket and twist, locking the plug in place so it remains secure when subject to movement and vibration. It can be used with a transfer switch or with an extension cable that splits the current into standard 120-volt sockets. To legally connect your generator directly to your household’s wiring system, it needs to be plugged into a professionally-installed transfer switch. This device breaks the connection between your house and the electrical grid when the generator is active to keep power from being sent into neighboring power lines where it could electrocute line workers. The switch will have its own twist lock plug, requiring a female to female twist lock cable to make the connection. Finding the right cable is easy since this socket combination is almost exclusively for transferring power between these two devices: just look for one that matches the maximum amp rating on your generator that has plugs that match both the generator’s outlet and the transfer switch’s plug. J – “Junior service” insulation rated at 300 watts. Wire without this designation is rated at 600 watts. For example, an SWPEO cable is a general use cord designed for outdoor use with parallel wire construction and a TPE outer jacket that is oil resistant. In general, cords should use TPE for durability, be weather and water resistant, and, if you’ll use it near oil-lubricated equipment like trucks and tractors, be oil resistant. The number after the “/” is the number of conductors, usually three to support a three prong plug and outlet. For example, “AWG 10/3” means the extension cable uses 10 gauge wiring with three conductors. 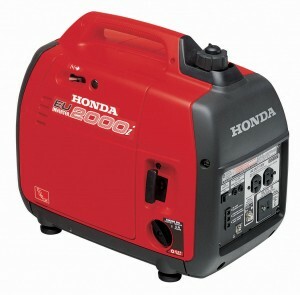 Hondalawnparts.com is a certified Honda Power Equipment dealer, so we’re able to offer OEM parts and accessories including power cords and transfer switches designed specifically for their generators. We ship across the U.S. and Canada.